Oh wait were we talking about Genghis in Lostbelt 3? I don't see that happening. The Lostbelts need change to grow. 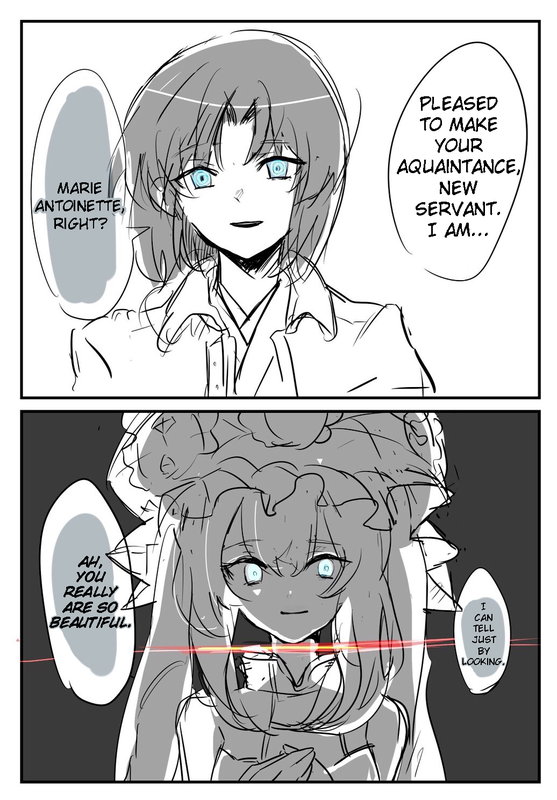 Its why the Second Lostbelt had a chance to prosper with Surtrs desth and her power able to be restored. Wodimes not only has that change, but is nearly complete in becoming human history. Eh? Lostbelts aren't like that just because of lack of change. Russia's changed rather drastically yet still had a respectable tech development rate for being a frozen hellhole. It changed initially but then was stuck like that for over 500 years. Even the tecnology has been the same and no one even remembers how to make them anymore. Same for the Second one. It's been stuck in a Skadi ice holding back Surtrs flames while humans are kept from overpopulation and giants under control by feeding the former to the latter for thousands of years. The Lostbelts are Lostbelts because they were nonviable for some reason or another, after all. If they weren't, the event that split them would be absorbed into the prime history. Russia was pruned because humanity stopped being Homo Sapiens. It might have survived in that hellish state if they didn't fuse with beasts, considering Last Encore Earth didn't get pruned despite a thousand years of being dead. Overcount incident was Quantum Timelocked in the Extraverse to happen so history is set in stone in that regard. The earth is finished in every Extra world because of the Harways and whoever they worked with. Last Encore didn't change that. A world ending winter is what really got it pruned because becoming furries was their only means to survival. Most timelines that winter never happens. Worth noting that disasters are not always necessary for a Lostbelt to form: utopias where humanity no longer has any reason to evolve will be pruned all the same. Which is why, if they keep the Sufficiently Advanced Aliens aspect of the Greek Pantheon, I want Wodime's Lostbelt to be the Gods, after being convinved of our worth as something more than simply toys to torment, introducing so many wondrous techonological and mystical marvels that humanity will forever remain in a state contentment, pets in the hands of the gods, never advancing, evolving or making anything for themselves, Brave New World-style, where humanity is stuck into the most Ironic Hell of having everything it wants handed to them on a silver platter. EDIT: I have a more technical matter to talk about: the FGO app is draining my battery in a way comparable to a starving fat man at a buffet. Anyone has any tips? I have a more technical matter to talk about: the FGO app is draining my battery in a way comparable to a starving fat man at a buffet. Anyone has any tips? Yeah, FGO feels like more of an iPad game than a cell phone with all the stuff it has. I'm close to making the switch myself. I get that, but going from 100 to 0 in less than 20 minutes is just bizarre. Normally my phone last aboout 6-8 hours when active. I think I'll also switch soon. Fortunately I should be able to just whop my sim card over and not have to deal with any contract hassle. Kakuzan I'm so fitted. from Miami Relationship Status: What is this thing you call love? Huh, I don't have that problem with my phone and it is a two year old LG V20. TPPR10 Return of Smugonai from Finland Relationship Status: Squeeeeeeeeeeeee! Waver arrives in Arcade . Ah, dammit, I want more Shiki in FGO! I get why they won't, she had seven plus LN for her, but still! Put her in more events, dammit! You put in Chloe and Sieg, why not the very first (and best) heroine of the Nasuverse!? My older phone had no issue either (even though its battery life was actually a bit worse), but unfortunetaly, it fell to the ground glass-first, the disply liquid broke and now there is only darkness. It's still somewhere around, waiting for the day I'll finally fix it. Which seems more distant by the day, but whatever. Hm, anyone have suggestions for finding the bounty hunt targets on JP? I'm sure some of them can be found from the daily class material quests. I used the guide in the newspost on r/fgoguide. Its slightly less AP than the appmedia one. More importantly it's a good resource for JP, since its sole content is newspost, translations and event/mission guides. Well this Halloween event in NA was less than my best. This is the first event in a long time I wasn't able to get all the Fou's from the shop. Put her in more events, dammit! I mean... she did get an entire event dedicated to her. And she got two versions of her(???). I still don't know what's up with Shiki and Void Shiki, and I think watching KnK gave me more questions than answers. Also a Tsukihime event hopefully before the remake. Much more importantly, Assassin Kohaku.